When Lake Elsinore shortstop Jace Peterson decided on a college, he wanted to go where he could play baseball and football. Once at McNeese State, located 15 minutes from his home in Lake Charles, La., he preferred the sport with innings and no clock over the game with the funny-shaped ball. "I liked both sports because each season was like a fresh start," said Peterson, a left-handed hitter whom MLB.com ranks as the No. 10 prospect in the San Diego organization. "In the middle of my sophomore year, I knew I wanted to pursue baseball, especially with the year I was having." Peterson, a supplemental first-round pick (58th overall) in 2011 who signed for a bonus of $624,000, has showed a solid glove during his three Minor League seasons and has stolen more than 30 bases each year. "He plays outstanding defense -- he has good range and his arm is strong enough for shortstop," said Storm manager Shawn Wooten. "He knows how to attack a ground ball. In my mind, defensively he is a Major League shortstop right now." Peterson certainly is no slouch with the bat either. He entered Tuesday's action batting .303 with a career-high 66 RBIs. After hitting four home runs his first two years combined, he has seven this season and is tied for the California League lead with 13 triples. In his last 10 games, he has a .389 batting average and his OPS is 1.097. "The biggest thing about professional baseball is to be mentally prepared every day," said Peterson. "The more you play, the better you get in games." Peterson hit .347 and scored 149 runs in 145 games with McNeese State. He was a college teammate of Lee Orr, who played with Lake Elsinore earlier in the season before being promoted to San Antonio in the Double-A Texas League. Wooten said playing football and baseball might have limited his experience initially but added that Peterson is learning very quickly. "He knows the intangibles of the game and has a good idea of the strike zone," said Wooten, who played six years in the Major Leagues. "He understands location of pitches and how to work counts. Earlier in the season, he saw some good players and watched how they did things. "A lot is just getting game experience and playing against good competition." Oberg top fireman: Scott Oberg, a right-handed closer for the Modesto Nuts, has a comfortable lead in the California League in saves. Oberg has 29 of them, nine more than Travis Ballew of Lancaster. Oberg, a native of Tewksbury, Mass., who played at the University of Connecticut, has eight saves and 15 strikeouts in his last 10 appearances. Real everyday player: With his pinch-hitting appearance Sunday, Inland Empire third baseman Brian Hernandez remains the only Cal League player to appear in all of his team's games. 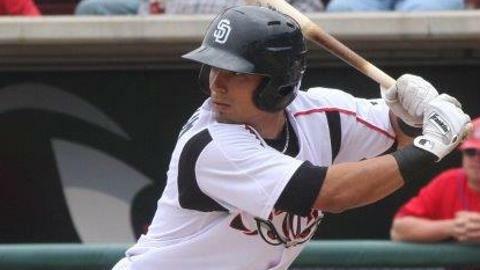 Hernandez, a 24-year-old who played at UC Irvine, has a .293 batting average with 75 RBIs and a team-high 43 walks. Movin' up roundup: Righty Robert Stephenson, we hardly knew ye. MLB.com's No. 2 Reds prospect made four starts for Bakersfield before being promoted to Pensacola in the Double-A Southern League on Aug. 13. Stephenson, who struck out 22 batters and walked only two for the Blaze, allowed two runs on two hits and three walks over six innings in his first start for Pensacola. ... Righty Michael Lorenzen, the Reds' supplemental first-round pick in 2013 (38th overall), was also promoted to Pensacola. ... The Seattle Mariners promoted lefty Scott DeCecco, left fielder Guillermo Pimentel and first baseman Jordy Lara from the Clinton LumberKings to the High Desert Mavericks, who are battling for a playoff position. ... The Houston Astros promoted righty Vincent Velasquez from the Midwest League to the Lancaster JetHawks. It's a homecoming of sorts for Velasquez, who was 9-4 with a 3.19 ERA with Quad Cities and lives in Pomona, Calif., less than an hour from Lancaster. George Alfano is a contributor to MiLB.com. This story was not subject to the approval of the National Association of Professional Baseball Leagues or its clubs.